Ingredients: Bulking agent (isomalt), extract (1%) of Ricola’s herb mixture, colour (plain caramel), sweeteners (sorbitol, aspartame, acesulfame-K), natural flavours (peppermint oil, menthol). 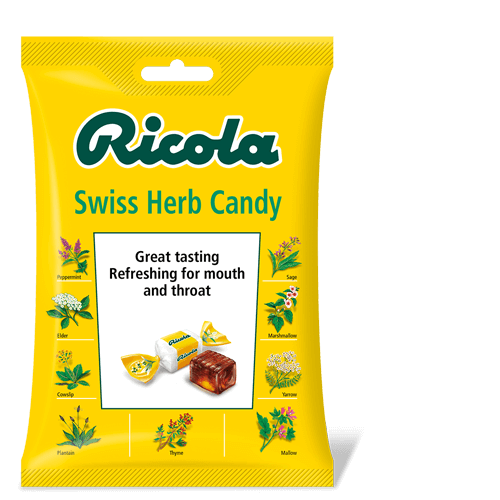 Ingredients: Sweetener (Isomalt), extract (1 %) of Ricola’s herb mixture, colour (plain caramel), sweetener (steviol glycosides), natural mint flavouring, menthol. 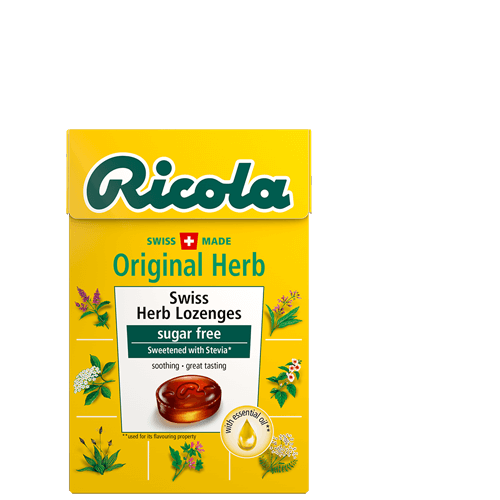 Ingredients: Sugar, glucose syrup, extract (1%) of Ricola’s herb mixture (plantain, marshmallow, peppermint, thyme, sage, lady’s mantle, elder, cowslip, yarrow, burnet, speedwell, mallow, horehound), colour (plain caramel), natural mint flavouring, menthol. The original herb drop is famous the world over. Company founder Emil Richterich invented the 13-herb mixture himself. The original herb drop has a distinctive cube shape unchanged since 1940. They have a familiar, aromatic taste and are highly effective at relieving coughs and sore throats. The recipe used to make the original herb drops loved by people around the world has not changed since 1940 and is a closely guarded secret. Without giving too much away, the special quality of the original herb drop comes from the 13 herbs used in the recipe: horehound, burnet, speedwell, marshmallow plant, lady’s mantle, elder blossom, mallow, peppermint, sage, yarrow, cowslip, plantain and thyme. In our vocabulary the word “herb” is normally taken for granted. But this is, or rather was, not the case for all countries. Hear about how the word “herb” came to Japan with our “original herb drop”.